So, the main idea is to populate simply populate JSON object with dialog values and save them into app or document label. But, label is String value, and JSON is object, so before saving we need to convert JSON to string. Easiest way to do that is to use toSource() which will generate String from JSON object. Another great thing is that we don’t have to think about escaping reserved characters, they are automatically escaped during conversion to string! OK, let’s explain this a little bit 🙂 Key part is in myValues(setObj, defValue) function which loads saved data if any, or assigns default data if no data stored. Keep in mind that setObj has to be the same when saving data (line 52), if not, data will not match! String which is loaded from label has to be converted to JSON object using eval() to make it accessible! 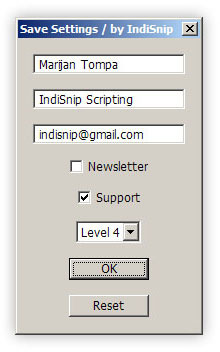 Maybe you can make this more efficient if you build your own ScriptUI widgets. You can implement this technique directly into widgets and add more control over content/values of your dialog elements. Cool! Thanks! I didn’t noticed that typo!